Great Tube Mod Kit Under $25! The performance of this vape is quite amazing for an all-in-one vaporizer, especially considering it's price. It gives a perfect balance to the device with the atomizer and the 1500 mAh battery. The AIO compatibility certainly is the cherry on the cake when it comes to the performance of this vaping device. It makes sure you get amazing control over the vapor production altogether. The performance is the highlight of this device. It is appreciated because it offers some of the latest hardware and features unlike any other vaping mod provides. It will beat all your expectations. The Joyetech EGO AIO (all-in-one) vape mod starter kit is one of the easiest to use vape devices that is both stylish and powerful. The team of experts at Joyetech have come together to put some extra effort into the designing and configuration of the device along with the number of interesting specifications and features that certainly make a difference in the new vapers available in the market today. 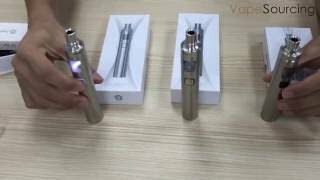 The starter kit of the joyetech ego AIO d22 comes with two drip tips where one matches the color of the same vaporizer and another the clear one. Both of the drip tips are held with a double o-shaped ring that tightly keeps them in place. You can also see an adjustable airflow that enables you to turn around the top of the vaporizer to open or close the airflow according to your wish. The eGo AIO D22 Xl is one of the most popular mods in the vaping industry because of its affordability, amazing features, specs, and simplicity. You will observe that both the tip and the body of the vaporizer are marked with tiny dots. When you align the dots in one row, it indicates full air flow and when you rotate the system apart, even closes the thing off. 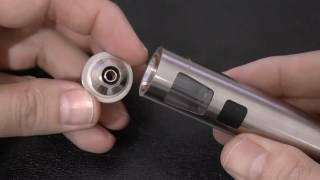 When you look down to the body of the joyetech ego aio d22 XL starter kit, you will see a cut-away window that shows you that inside of the tank. If you buy the two-tone version of the joyetech ego aio d22 XL starter kit, you will see a fill line located where the colors alter. When you buy the solid color starter kit, you will see small silver indicators at the top of the filling line. At times, when you overfill the tank, you will get some serious issues with your coils. The coils might get flooded or leak, you need to watch those lines carefully in order to prevent leakage or flooding. You can expect some features lacking from the eGo AIO, no wonder why it is so cheap in the market. The company attempted to have an ideal simplistic and minimalistic design of the tool making sure that the vape mod only provides the basic needs and functions and reduces the price altogether. A perfect for a basic user who wants power without the hassle of adjusting the controls. However, the device has some amazing features to name, such as the ability to direct to lung or mouth to lung vaping, the amazing airflow of the system, and the high-quality AIO capability. Coming down further to the body, you will see a large square firing button that indicates whether the device is turned on or off. Opposite to the firing button, you will see the charging port on the back side of the device. It is easy to leave your device upright while charging and this also prevents accidental firing cases. The rest of the body is built in 2300 mAh battery with 22 mm length. The device is considerably built and comes with amazing features and characteristics that make it very high quality and high maintenance device. It is one of the most stylish vaping mods available on the market with a good tank and high-quality battery. The eGo D22 XL is one of the best selling and popular vapes available today. You can use it with a mouth to the lung, or you can use it directly with the lung pulling method that will give you satisfactory results while using this amazing piece of tool. This tool appeals to some of the users more than others. The design of the device manages to offer a leak-proof feature and somewhat a good looking matte finish. It has a total weight of 118mm and diameter of 19mm. The vape is quite small in size and too stubby. But, it is handy and fits your palm easily. The vape has a decent weight as well, but it is nowhere too heavy that it becomes a problem to you while carrying around. The performance of this vape is quite amazing for an all-in-one vaporizer, especially considering it's price. It gives a perfect balance to the device with the atomizer and the 1500 mAh battery. The AIO compatibility certainly is the cherry on the cake when it comes to the performance of this vaping device. It makes sure you get amazing control over the vapor production altogether. The performance is the highlight of this device. It is appreciated because it offers some of the latest hardware and features unlike any other vape mod provides. It will beat all your expectations.